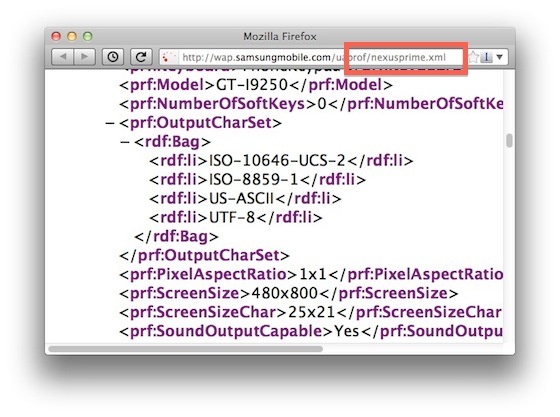 Nexus Prime Name Confirmed Through Samsung Site? If that cease and desist letter that rolled out to an Android community developer from Samsung wasn’t all-that-believable, then maybe this xml file found on their very own site is. If you were looking for proof that the next Nexus will be known as the Prime, then this might be just what you were looking for. Can you see it up there? The model number GT-I9250 and that little “nexusprime.xml” spot. With that said, this UA profile isn’t blowing anyone’s mind with specs. Is that a 480×800 screen resolution? What happened to that HD goodness? Don’t freak out just yet, as this could be a place holder that needs to be updated…hopefully. Can you imagine Google not doing their part to give us the next godly-spec’d phone? I guess they skimped on the Nexus S, but with this phone launching with Ice Cream Sandwich, I would imagine that it will blow minds. Cheers Jigga_z and everyone else!